We continue our run through the Top 100 Cardinals players in their history, and at long last, we’ve arrived at our Top 30. This group consists of four starting pitchers — one pitched for the Cardinals at the turn of the 20th century, and another at the turn of the 21st century — and a third baseman who might have a case for most underappreciated Cardinal in their history. The current crop of Cardinals pitching prospects would do well to emulate Morris’ rookie season which came in 1997. At just twenty-two years old (for reference, Luke Weaver is twenty-four and Alex Reyes is twenty-three) Morris threw 217 innings with a 3.19 ERA. When you consider the run-scoring environment of the late 1990’s, Morris looks even better: as a rookie, he was 31% better than league average according to Baseball Reference’s ERA+. He missed much of the next three seasons due to injury but returned to lead the league in wins in 2001 with 22, to go along with his 3.16 ERA. He finished third in the Cy Young voting, behind co-aces of the eventual world champion Diamondbacks, Randy Johnson and Curt Schilling (credit to the votes: they looked beyond Morris’ superior win total). Matt Morris is a link in the chain of Cardinals aces that started with Darryl Kile, went through Morris, and includes Chris Carpenter, Adam Wainwright, and Carlos Martinez. That fact shouldn’t be overlooked, and when you pair it up with some impressive statistical accomplishments, Morris is certainly deserving of his spot on the list. Joe Torre was already a nine-year veteran when he was acquired from the Atlanta Braves for Orlando Cepeda prior to the 1969 season. While Torre had the misfortune of being a Cardinal during stretches of less-than-championship caliber baseball — twice. 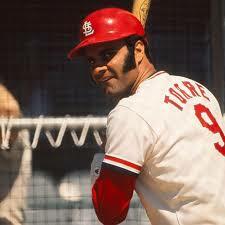 Torre earned MVP votes or was an All-Star each of his six seasons in a Cardinal uniform, and won the award in 1971. Torre got the nod over legends like Willie Stargel, Hanke Aaron, and Roberto Clemente. Strictly speaking, it’s hard to make the case that Torre was the most valuable player in 1971. His WAR of 5.9, while excellent, pales in comparison to the 12.0 WAR of Fergie Jenkins or the 10.9 WAR of Tom Seaver. Torre did have an excellent season, however. He hit .363 with 24 homers and 137 RBI’s. Torre managed the Cardinals in the mid-90’s as well, and even though we aren’t counting his managerial accomplishments in his score (I wasn’t born yet, but I hear there isn’t much to remember from those years), he is a Hall of Fame manager due to his four World Series titles as the Yankees manager. I don’t know about you, but I didn’t know Cy Young was ever a Cardinal. What’s more interesting than what Cy did on the field — which included two seasons of over 300 innings pitched each — is how he was acquired, and later, how he left. Prior to the 1899 season, which was the only one in which the team was referred to as the “Perfectos”, the Robison brothers bought the franchise from Chris Von der Ahe. There was one small problem with the transaction: the Robison brothers also owned the Cleveland Spiders. Such a conflict of interest would require a special prosecutor and serious Congressional oversight today but apparently was hunky dory in 1899. In any event, the Robison brothers chose to stack the Perfectos. They did so by “transferring” Cy to the Perfectos; the Spiders were not compensated in any way. Two years later, the startup American League was poaching players from the National League primarily due to their higher salaries. Young took the Boston Americans (late the Red Sox) up on their offer and jumped from the Cardinals to the Americans after just two seasons in St. Louis. While it’s somewhat disappointing an all-time great couldn’t have a longer career in St. Louis, they never should have had him in the first place. Max Lanier is another interesting case of players pursuing their financial interests. In a three-year period from 1942-1944, a period that included three pennants and two World Series titles, Lanier won 45 games and posted an ERA of 2.47. A hard-throwing lefty, he led the league with a 1.90 ERA and 1.78 ERA+ in 1943. Lanier was equally dominant in the postseason. He pitched four innings out of relief in the ’42 series against the Yankees and didn’t allow an earned-run. He started two games in each of the next two World Series and threw 15 1/3 and 12 1/3 innings respectively. In total, he only allowed six earned runs in his three World Series, good for a 1.71 ERA. His career took an interesting turn in 1946 when he attempted to jump to the Mexican League to make more money. His move violated the Reserve Clause, and he was suspended five (!) seasons for his troubles. He challenged the Reserve Clause in federal court but dropped the lawsuit when he was reinstated in 1949. He never regained his pre-suspension form and was traded for Eddie Stanky in 1951. Pete “Grover” Alexander was an eight-year member of the Chicago Cubs when he was claimed off waivers in the middle of the 1926 season. After being claimed, Alexander started 23 games for the Cardinals and finished 16 of them. According to his SABR bio, he is the only player named after a sitting US president, and portrayed by a future one ina film (Ronald Reagan in The Winning Team), and “except for Ty Cobb among his contemporaries, perhaps no player had to cope with as many personal demons.” He struggled with alcohol and mental illness throughout his life. Alexander is most known for his heroics in the 1926 World Series, which included complete games in games two and three, as well as a save in game seven. With the Cardinals clinging to a 3-2 lead, Alexander, not known as a strikeout pitcher, struck out Tony Lazzeri to nail down the first title in Cardinals history. He won 21 games in 1927 and 16 in 1928, but at 41 years of age, his skills were declining. Alexander, along with Harry McCurdy, was traded to the Phillies for Bob McGraw and Homer Peel following the 1929 season, and Alexander retired a member of the team that originally signed him in 1911. Thanks for reading, and come back tomorrow for the numbers 25 through 20.